A colourful wooden bus with onboard musicians and cheering people just drove past you? "What WAS that?" you ask in a daze of noise and lights. That, my friend, was a Chiva; Colombia's public transport of old, turned to good use shuttling tourists and revelers around the city in the most warmly Cartageneran way possible. There's two main ways to chiva (yes, I've made it a verb): the afternoon chiva tour that takes you to all the key sites around the city and the night time party chiva. 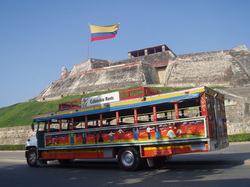 Four hours on a bus might seem a little overwhelming, but I recommend the Chiva Afternoon historical tours as the best-value way to see the main tourist attractions of Cartagena including the San Felipe Fort, the giant boots, the bays of Bocagrande and Manga and the grand houses of El Cabrero. The tour includes entry to all the attractions and bi-lingual guided information (it's a fairly acceptable level of English.. not incredible). Considering the entry price to the San Felipe fort is about 25,000 pesos alone, .. then you'll appreciate the 55,000 peso ticket price is good value. This is a great way to get all the tourist "should-dos" out of the way. As the bus snakes its way around Cartagena, you will get a better understanding of the different areas of the city to help orientate you for the rest of your stay. But it is hot. And it is long. So if you're not necessarily looking for the cheapest option, you might prefer springing the extra cash for a private tour in an air-conditioned car or van. Whilst we no longer manage the booking process, you can easily find a bazillion people falling over themselves to sell you a ticket, especially close to the Torre del Reloj (Clock Tower). (Putting the RUM into RUMba, the night Chiva tours are a distinctly Colombian affair with live musicians playing Vallenato, an open bar with local liquor and plenty of opportunity for fun. You'll tour around the city of Cartagena (which looks even more romantic and captivating at night!) and make new friends while you chair-dance your heart out. They are definitely tacky.. and there is almost no English spoken.. but with the right group they can also be a lot of fun if you come armed with the right attitude. The night chiva tours run for 3-4 hours, include your booze and some snacks plus entry to a club afterwards. All for the bargain price of 45,000 pesos. - cover entrance to a night club at the end of the tour. The tour starts from Barrio Laguito at around 8.30pm and ends at 12am (this timing includes the Nightclub at the end). If you are really primed to party, you should be aware that the Chiva usually doesn't hand out the rum until all the passengers have been picked up.. so maybe bring along a little sumthin sumthin if you're feeling too "thirsty" to wait.